Melanie Koss knows a great book – or a great graphic novel – when she reads one. 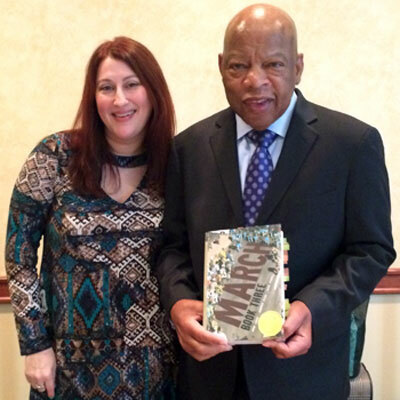 And, Koss says, Congressman John Lewis’ “March: Book Three” is a triumph. Its sweep of the American Library Association awards for 2017 includes the prestigious Michael L. Printz Award, which recognizes excellence in young adult literature. 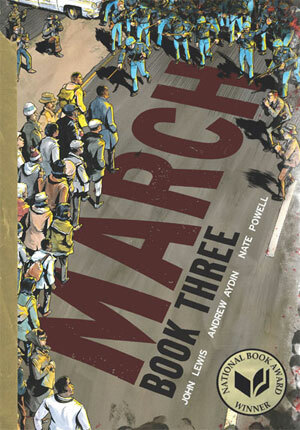 Written by Lewis and Andrew Aydin and illustrated by Nate Powell, “March: Book Three” also won the Coretta Scott King Book Award, the National Book Award for young people’s literature and the Walter Dean Myers Award for Outstanding Children’s Literature (Young Adult category). 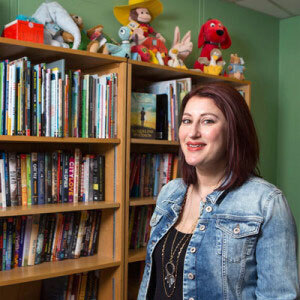 But for Koss, an associate professor in the Department of Curriculum and Instruction with expertise in children’s literature, young adult literature and multicultural children’s literature, it’s the Printz that means the most. She chairs the nine-member Printz committee this year. “The book starts with the bombing in Birmingham and ends with the march on Selma, with intermittent jumps to Past-President Obama’s inauguration and Lewis’ interactions with Obama as a congressman in present day,” Koss says. “Not only is this graphic novel telling the story of a very important time in American history, it’s the way it’s telling it. It’s from Congressman Lewis’ point of view, and the artwork perfectly enhances the text,” she adds. Following a weekend of closed-door deliberations in Atlanta from Friday, Jan. 20, through Sunday, Jan. 22, Koss and her Printz committee colleagues enjoyed the opportunity to inform Lewis about the award and to congratulate him in person. Her phone call to Leigh Walton, the congressman’s publicist, made it happen. While en route to a conference book signing, and a day after leading Saturday’s Women’s March in Atlanta, Lewis stopped at the hotel where the various ALA awards committees were encamped. “We were all standing there and, as chair, I was able to tell him that he had won, and just how thrilled and honored we were that he had written such a powerful book,” Koss says. Lewis was “surprised, honored and gracious,” Koss says. “He told us how much he appreciates the support his book is getting from the library and education communities, and how important – especially now – learning from history, and moving forward, is for your nation’s youth,” she says. Lewis will visit Chicago this summer for the annual ALA conference, where the awards are officially presented. Until that time, Koss expects that momentum will continue to grow for all three installments in the “March” trilogy. “Graphic novels are often not considered literary enough for the classroom, but graphic novels – as a medium – are something young adults really like. We live in a visual society, and text with images resonate with our nation’s youth,” Koss says. “Another reason this book is so powerful is the topic. It’s so authentic and honest. It doesn’t sugarcoat,” she adds. Four Printz Honor Books also were named: “Asking for It,” by Louise O’Neill; “The Passion of Dolssa,” by Julie Berry; “Scythe,” by Neal Shusterman; and “The Sun Is Also a Star,” by Nicola Yoon.